Why get a watch box? 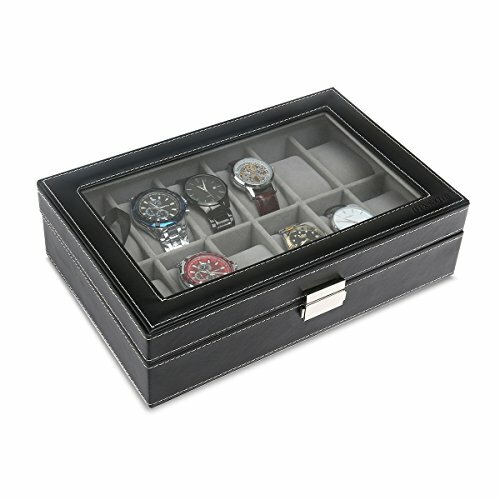 A watch box can make the ideal gift for someone or be a great way for you to tidy up your own collection of precious timepieces. It will keep them safe, protected, and clean making them the ideal place to store your watch once you’re done wearing it for the day. 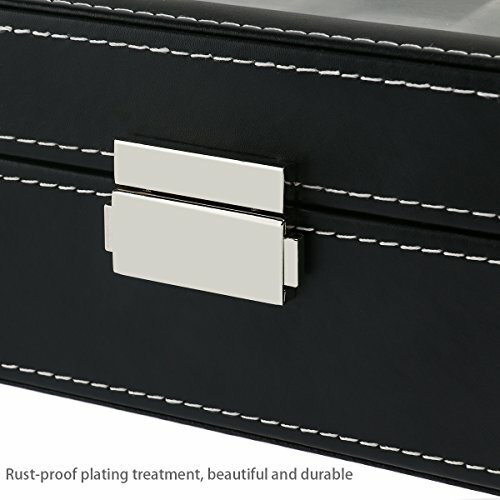 Whilst you’ll notice there are many options to choose from ranging in prices, this watch box from Pixnor offers you an affordable option without slacking off in quality. I ordered the watch box via Pixnor’s Amazon store here, it arrived in good time and was packaged very well, plenty of bubble wrap and a cardboard sleeve around the box itself. As I was unpacking it I could feel it had some weight to it, this is something I appreciated as it felt higher quality. The box is made with a sturdy wooden case that gives it that weighty feel. I figured it would be important to check it over and have a look at the corners and the stitching to check for damages, everything was perfect so you can tell care and attention have been put into the mailing process. I sat the watch box on my desk so I could have a good look at it. The lid is fastened with this nice little double push button release clasp that securely holds the lid in place. On opening the watch box I was able to take a closer look at the velvet lined compartments. I actually have a fairly expensive £200+ watch box and can honestly say there doesn’t appear to be much difference at all in the quality of the velvet lining and cushions. As I mentioned earlier, the watch box is made of wood and covered with a stitched style synthetic leather that looks very nice. The lid has a glass top so you can view and display your watches, it stays open on its own once lifted and is held in place by a ribbon. The watch box is designed to hold 12 watches so I went ahead filling it up with a variety of different shapes and sizes of watches (not difficult when you have over 60 watches lying around). I’m pleased to say everything fit in nicely, there is a good amount of space between the glass lid and the velvet cushions so there was no worrying about accidently catching the top of a watch. A sturdy well built wooden design. Can store up to 12 watches which is plenty for anyone with a starter collection of watches. A clear glass see through panel on the lid makes it great for showing off your collection. Nice quality stitched synthetic leather makes the box look great. Time to wrap this Pixnor watch box review up. When I first ordered this box I was quite excited to see the quality of what would arrive. 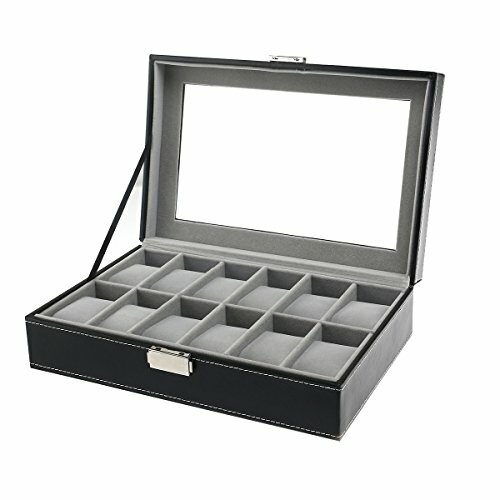 The watch box exceeded my expectations and I’m happy to say I’d definitely recommend it to someone who is looking for an affordable option for their watch storage. The quality was better than I had expected, it’s well built and delivered very safely. I’m giving this watch box a 9.5/10 from ‘The Watch Blog’ for offering very good value for money. If you’d like to purchase one follow this link to head straight to their Amazon store.